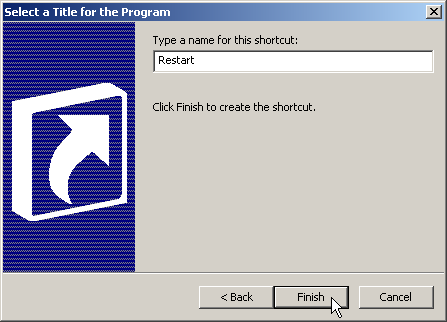 Create a restart shortcut on your computer desktop to avoid having to navigate your way through the Start Menu. 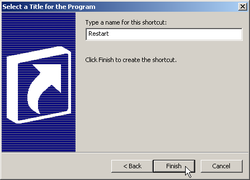 Quite often, restarting our computers becomes a necessity after installing certain programs or program updates. When you choose to restart it later, you will find this easy customization a real time saver! 1. Right-click on a blank area of your computer desktop, select New and slide over to Shortcut. This will create a default icon titled New Shortcut and will open an edit window. 3. Type the name for the shortcut, in this last window. 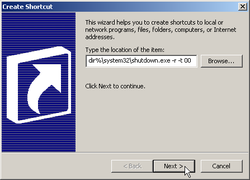 By default, drawing from the location previously entered, the name will show as shutdown.exe. You can leave the file extension off and capitalize the S. For that matter; you can change the name to anything you desire, "Refresh" for example. Once you have entered a name, click Finish to create the shortcut. 4. Right-click and Save Link As... to download the Windows icon file to the left. Scan it for viruses as you should scan any download. Cut and paste it from your Download directory to C:\WINDOWS\system32, before proceeding to the next step. 5. 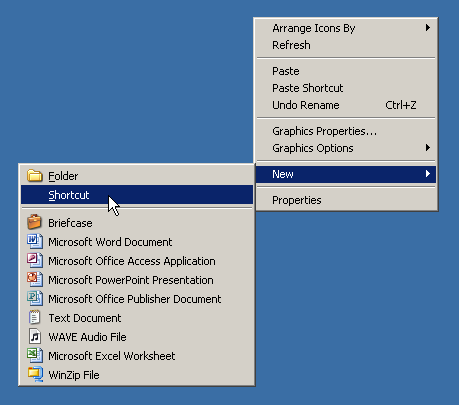 Change the default executable icon by right-clicking on the shortcut and select Properties. Clicking Change Icon... will invoke a pop up window stating "The file %windir%\system32\shutdown.exe contains no icons. Choose an icon from the list or specify a different file." Click OK to open the next window and you will see icons stored in SHELL32.dll. 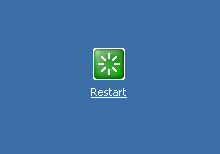 The icon Windows uses as the Restart symbol is not found there. Unable to find the original icon location, I recreated it as a download. Click Browse... navigating to the restart.ico file you pasted in C:\WINDOWS\system32. Once selected, click Open then OK to close each window completing the process. * Type the name of the file in the Browse-to window, to find it faster. * Most program executables and a fair number of dynamic link libraries (dll's) contain icon files which you may use in place of default shortcut icons. * Use Microsoft's Powertoys for Windows XP (Tweak UI) to remove the shortcut arrow. This program will not work on newer releases. * If you later decide that you do not want this shortcut, simply delete it. * While adding the -f parameter to the file location (%windir%\system32\shutdown.exe -r -f -t 00) will force all open programs to close immediately, this may contribute to file fragmentation. What's a few more seconds anyway? * Remove the copyright/backlink information before pasting the above string into the shortcut window.